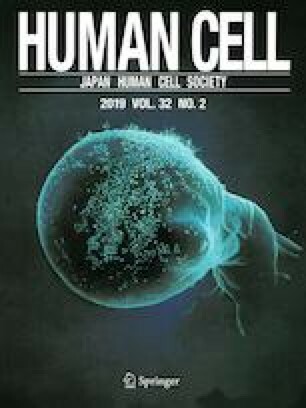 To clarify the potential role of gap junction in cell–cell contact response, the expression of connexin30.3 gene (Cx30.3), a specifically expressed isoform in undifferentiated state of mouse embryonic stem (ES) cell line EB3 was investigated under different cell–cell contact conditions. ES cells were cultured by hanging drop culture method to increase cell–cell contact frequency. As control, a single cell culture was conducted. After culture for 12 h, the Cx30.3 expression level in hanging drop culture reached 1.73-fold that of the control (p < 0.001). By contrast, connexin43 gene (Cx43), a ubiquitously expressed gene, showed no difference between both cultures. The experiment of E-cadherin inhibition and β-catenin knockdown suggested the action of E-cadherin upstream of the Cx30.3 regulating pathway. The cell–cell contacts with different cell lines such as HeLa cells and B16/BL6 caused no effect on the Cx30.3 in ES cells. These suggest a potential role of Cx30.3 as a cell–cell contact signal mediator partially regulated by E-cadherin signaling. This work was partially supported by a Grant-in-Aid for Scientific Research (C) Grant number JP16K07343.